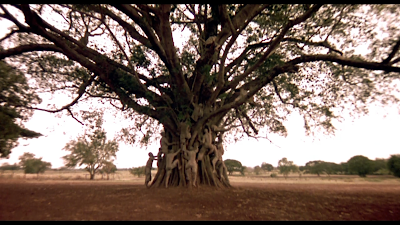 The movie begins with an exciting competition to retrieve a flag fixated atop a tree. 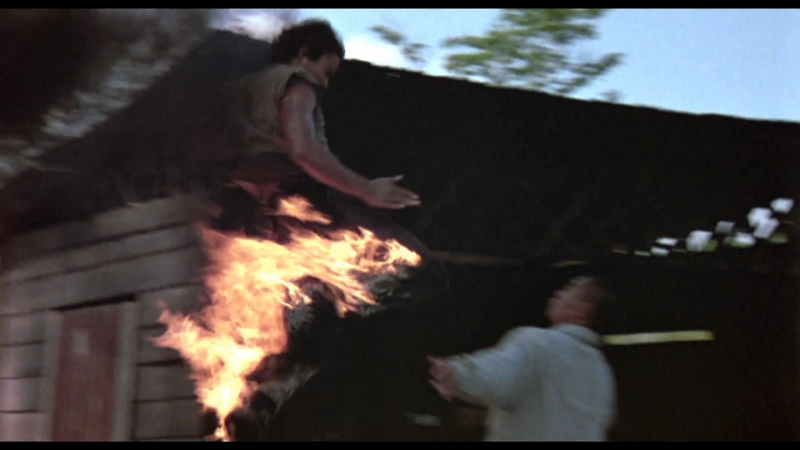 The winner is Ting (Tony Jaa). 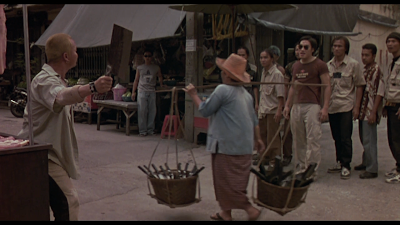 We later see him training muay Thai and his master, having taught him what he has learned, says Ting must not use it. In the middle of the night, the head of Ong-Bak is stolen, taken from the statue upon which it normally sits. Important to the village, they assign Ting the task of retrieving it. Ting begins by meeting his cousin Humlae in the city. Humlae is reluctant to help Ting, until he sees Ting's money, which the village gathered for Ting's journey. When Ting isn't looking, Humlae swipes the money and goes to bet it on a fight. Ting pursues Humlae and finds him in the fighting arena. He just wants his money back, but in doing so walks into the fighting circle and is taken to be a challenger. He anti-climatically wins with one blow. Above the arena, we see two rich men betting on the fights. The one man who lost his bet is upset when Ting wins. Upset that Humlae stole the money, Ting leaves with his money. The next day, Humlae and Muay, a friend of Humlae's who we met earlier, try to pull another scam to earn money. They're slightly successful, but run into a guy and his gang who they scammed earlier. As Humlae is getting beat up, Ting passes by and Humlae asks for help. Ting helps fight off the guy and his gang. They leave, but then return with more and pursue the Ting and Humlae. 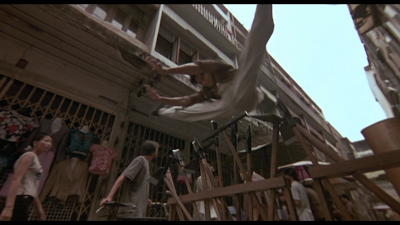 A fun chase scene ensues where we get to see Ting pull off fancy jumps in order to put a distance between him and his pursuer. Humlae occasionally copies some of the same movements to a humorous effect. The chase ends with Humlae and Ting escaping, and Humlae promising to help Ting find Don. They return to the fighting arena where Humlae says Don often comes to deal drugs. While there, Ting is goaded into fighting. In total he fights three competitors and consequently the same man who bet against him loses three times. He's grown furious. The plot continues to escalate. Having watched the movie once before, I remembered various scenes, like the opening scene and the chase scene with the barb wire. But I didn't remember the car chase and some of the fight scenes. I also forgot the plot of the movie, so watching the movie today was fun. However, I guess there was good reason I didn't remember the plot: the interesting part of the movie is the action. The fight with the fire rocks. Today, I watched all of the special features with the exception of "The Making of the Music Video." Let's see, there was a Tony Jaa exhibition in France, there was a music video in French (some English), there were teasers and trailers in English, in Thai, and in French, all different, there were B-clips which I guess were unused clips, and there was Muay Thai movements. Some of the teasers and trailers were good. Some not. The Muay Thai movements and the exhibition special were cool. The music video was uncool. The B-clips weren't exciting. The one with the rap group making ooo and ahhs when the kicks connect in the fight club was funny. I would summarize and say half of the special features were good. We had the option of Thai or English audio and English, Spanish, or no subtitles. We went with the standard option. While the story isn't too interesting, the action is awesome and makes the movie worth watching. 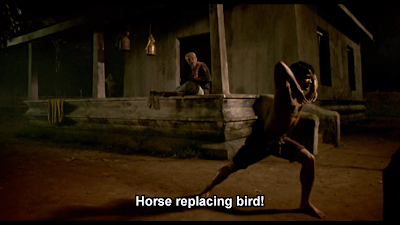 Today, I found out (from Wikipedia.org) the version made available in the United States is an edited version which changed the score, removed the subplot involving Muay's sister Ngek, and apparently shortened the final showdown between Ting and Komtuan's bodyguard. In the movie, we see Ngek refusing to further push drugs for Don, to which he responds by shoving heroin into her mouth. When Ting and Humlae find Don, we see that Humlae recognizes Ngek and calls her name several times. However, since any mention of her earlier in the movie was cut out, I was definitely confused. 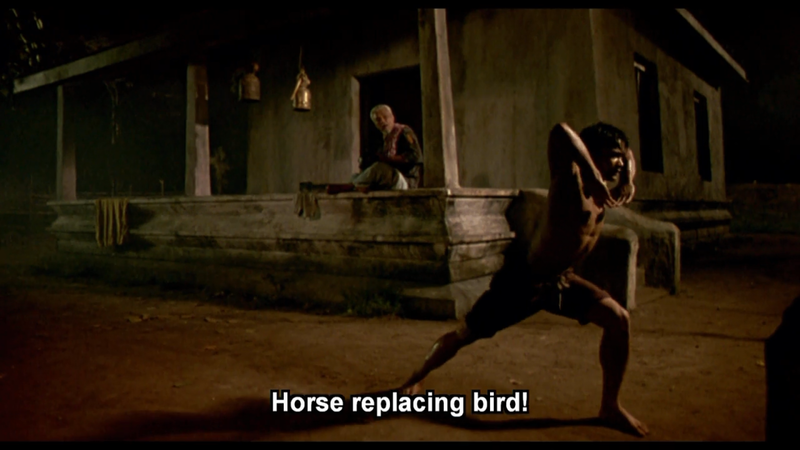 Ong-Bak: The Thai Warrior (2003) Prachya Pinkaew. 105 min.